The Christian life was never meant to be lived only while sailing smoothly on calm seas. What advantage would there be to the notion that God is a refuge if we were never under attack? Would we ever know that God deigns to be our strength if we had never known weakness? And what of this idea of Him being our present help if we’ve not experienced the immediacy of pending trouble? Life in a fallen world begets trouble all around. In the world, the flesh, and the devil a sinister triumvirate looks to wreak havoc upon the sons and daughters of Adam. Jesus, not unaware, nor unfamiliar, with every trouble we would encounter gives us hope in the midst of gathering storms. His encouragement to His disciples is one of tenderness as the storm clouds approached. Their trouble was immediate anxiety. His word to them was "Fear not, little flock, for it is your Father's good pleasure to give you the kingdom.”(Luke 12:32). Imagine the relief that those four words brought- “Fear not, little flock”. This is real hope. Fear must flee at the word of the Good Shepherd. The world, the flesh, and the devil must bow at His command. Anxiety must give way to hope. Even death must ask permission. God can be trusted, because He is God. He is the absolute sovereign and therefore He can be our trustworthy refuge and strength. One has only to look at the Cross to see an assurance of God’s immediate help in trouble. That trouble that was far more vexing than anything the world, the flesh, and the devil could conjure up has been mitigated by the Son’s obedience to His Father. This is amazing love. This is the love of immediacy that binds frightened, troubled and anxious sheep to their Shepherd. It is my hope that you are resting in the Shepherd’s love, even when you see the storm clouds gather. He is not unaware, He is our very present help. For the last several years we have been in the halcyon age of church planting. Everyone wants to be a church planter and it seems that for a long time every Sunday there was a new street level sandwich board advertising a new church with a trendy name. The names are not descriptive of something substantive; in fact, out here in the Northwest we even have, The Coffee Church(!). Moderately able worship leaders are in high demand and often move from one trendy new church to another. During our church plant we even had musicians solicit us for a place on the team. For them there was no philosophical or theological inquiry; simply a tight worship set was the draw. Today we finished up a 5-day vacation with family in Idaho. On our way home and just outside of Walla-Walla we got off the beaten path and drove to the Whitman Mission. Every time I visit here it has a significant effect upon me. 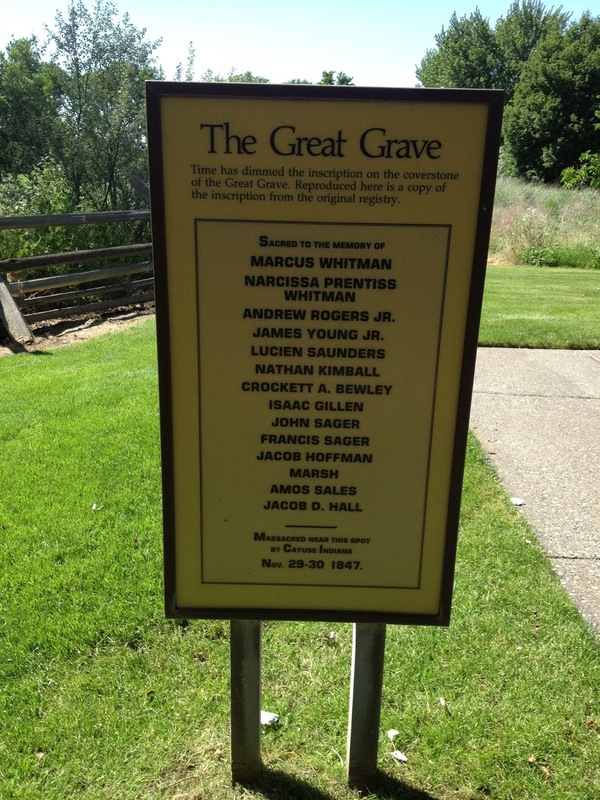 If you don’t know the story of the Whitman Mission let me give you a little history. In 1836 several Presbyterian missionaries made their way along the Oregon Trail and settled near Walla-Walla. Of those who made the trip were Dr. Marcus Whitman and his wife, Narcissa. They married on February 18, 1836 and the day after their wedding they left for the Oregon country. They were convinced that they were called to bring the gospel to the Indians and to help them by educating them. The Whitmans committed their lives to loving and serving the natives in the area. Their life was not an easy one. Their first winter was spent in a very small hut, and the second winter their home was flooded out and they had to move to higher ground. Their only child Alice Clarissa was born in 1837. At age 27 months she drowned in the river just outside of their home. Their lives were characterized by privation, hardship, and backbreaking toil. In 1844 seven children arrived at the mission that had lost their parents in the journey across the Oregon Trail from Missouri. Marcus and Narcissa adopted them as their own. Known for their hospitality, their home was place where those headed west often stopped, but they never lost sight of their first priority to bring the gospel to the native Indian tribes in the area. On April 2, 1847 Dr. Whitman ended a letter this way, he said, ‘…we live at all times in a most precarious state….’ And then on November 29th, 1847, 11 years after they had begun their mission, Marcus, Narcissa and 11 others were killed and another 47 were taken hostage. In a terrible misunderstanding and tragic circumstance the Whitman mission came to an end, and for almost forty years Presbyterian missions came to a halt in the Pacific Northwest. 1) Sometimes signing up for ministry is akin to signing a death warrant. Often there is no forward progress of the gospel without significant suffering and this should not surprise us. After all, the blood of the martyrs is the seed of the church. 2) Sometimes the people God sends you to serve will not let you out alive. It is an interesting tension biblically, but if you look at the life of Jesus there was a great deal of difficulty imposed upon His ministry by those closest to Him. For another eye-opener do a little research on Jonathan Edward’s last days at Northampton. The servant is truly not greater than the master. 3) The most thankless job in church planting is that of the church planting pastor’s wife. Untold grief, tears, and hardship are sown by the church planter’s wife as she serves alongside of her husband, and God records every one. 4) Bi-vocational church planting is profoundly difficult. It requires a rare skill-set and often comes at an incredible cost to family and well-being. Marcus Whitman was both a doctor and a missionary, and even wore several other hats as he toiled at the mission for 11 years. 5) There are casualties in church planting. Sometimes this means reputation, sometimes relationships, sometimes our very lives, but anything worth something will require everything. We are fools to think of church planting lightly, particularly knowing the gravity of what’s at stake. 6) Sometimes it is impossible to count the cost beforehand. There are some tasks that God calls us to that we would run far away from if we knew what they would cost us. God gives grace in the moment and not beforehand. 7) Church planting success cannot be measured in the here and now, but can only be accurately considered in light of eternity. Sometimes success looks like failure and sometimes failure looks like success. In the eyes of some the Whitman Mission was a colossal failure, and as a church planter it was a strong temptation to look at numerical growth as the yardstick for true success. This is a fool’s errand. Wood, hay, and stubble, as opposed to true gospel fruit, will be made known at the day of the Lord. I’m thankful for men and women like Marcus and Narcissa. They paved the way for missionaries and church planters that would follow. It may not be pretty as we consider the incredible cost, but they’ve showed us the inestimable value of bringing the good news.